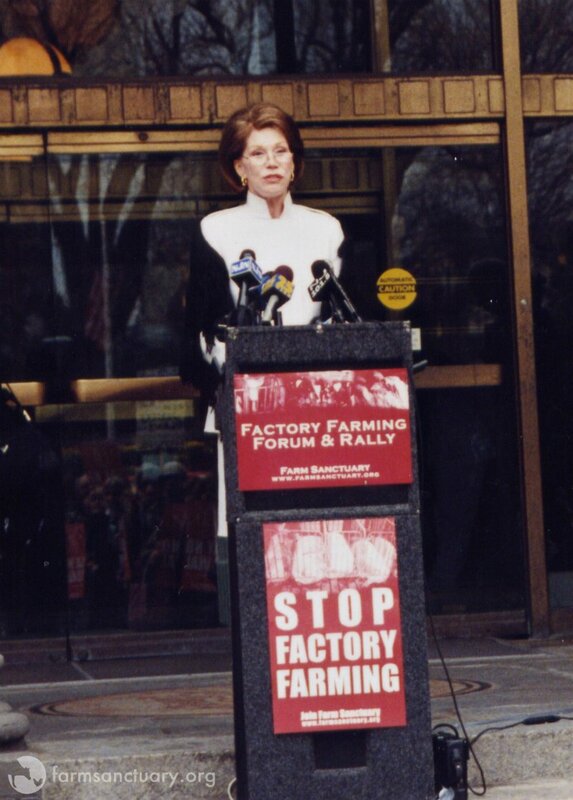 Mary Tyler Moore speaking about farm animal protection and factory farming . 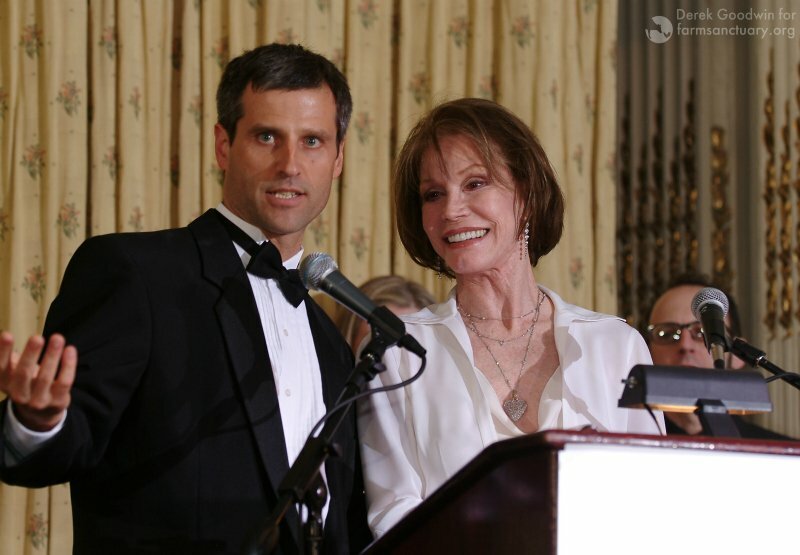 We are deeply saddened by the passing of Mary Tyler Moore, an inspiring, passionate, and dedicated advocate who worked throughout her life to champion the rights of all animals. 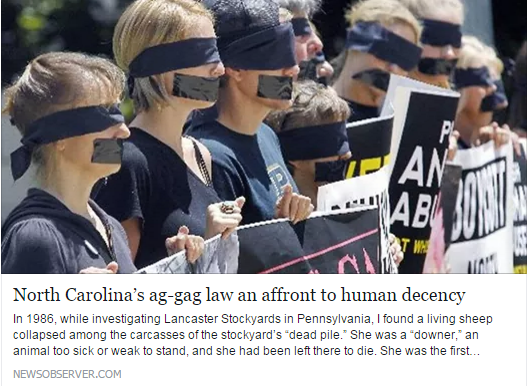 She was a true — and beloved — friend of Farm Sanctuary who used her prominence as a platform from which to speak out for farm animals. 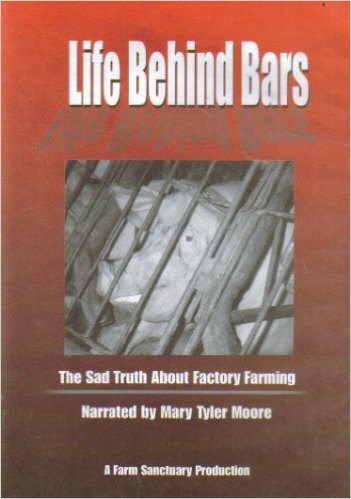 Video: Mary Tyler Moore worked with Farm Sanctuary to expose the harsh reality of “Life Behind Bars” for farm animals. 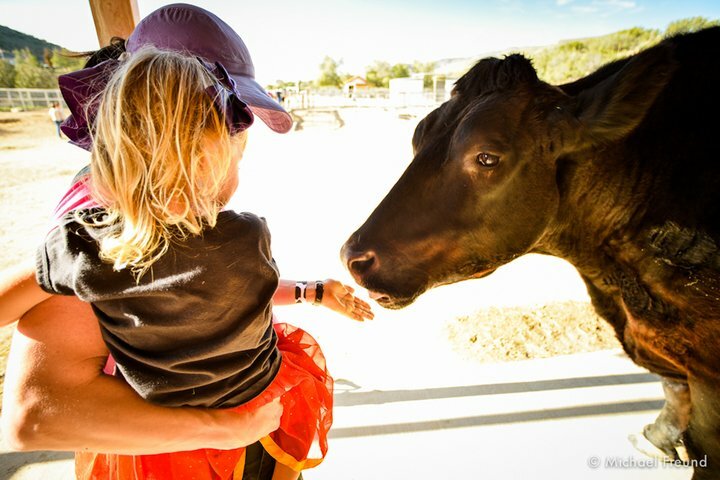 “I’ve always felt a connection with animals, felt that they have emotions, that they suffer as we do, that they could teach us a great deal about compassion,” she once wrote. Thank you, Ms. Moore, for your compassion, dedication, and friendship. The world is a kinder place because of you. 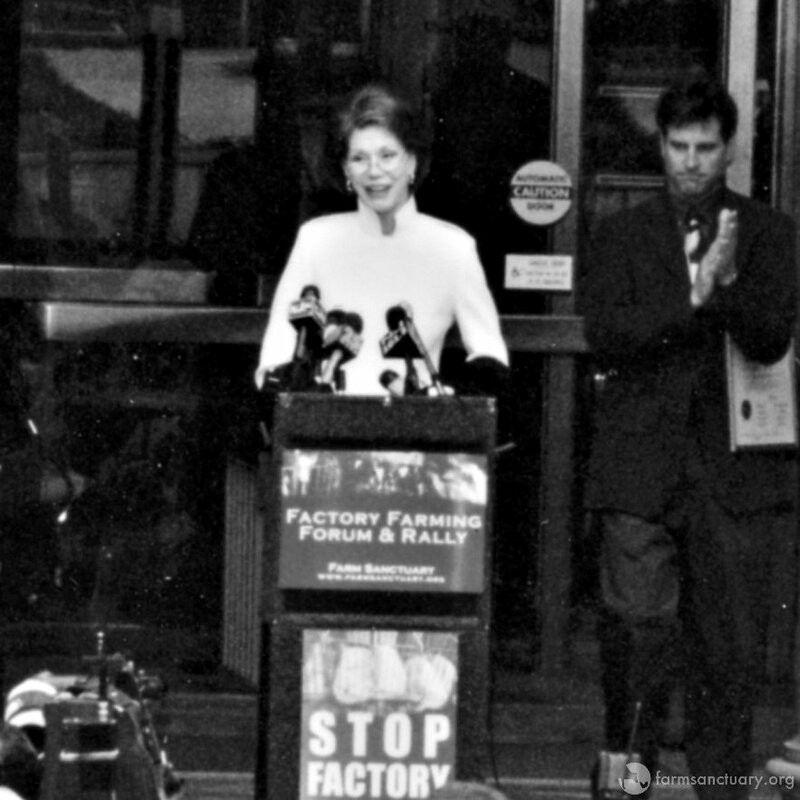 Gene Baur looks on as Mary Tyler Moore speaks out about factory farming. Gene Baur and dairy-industry survivor Ari. Back in August, the office of New York Gov. 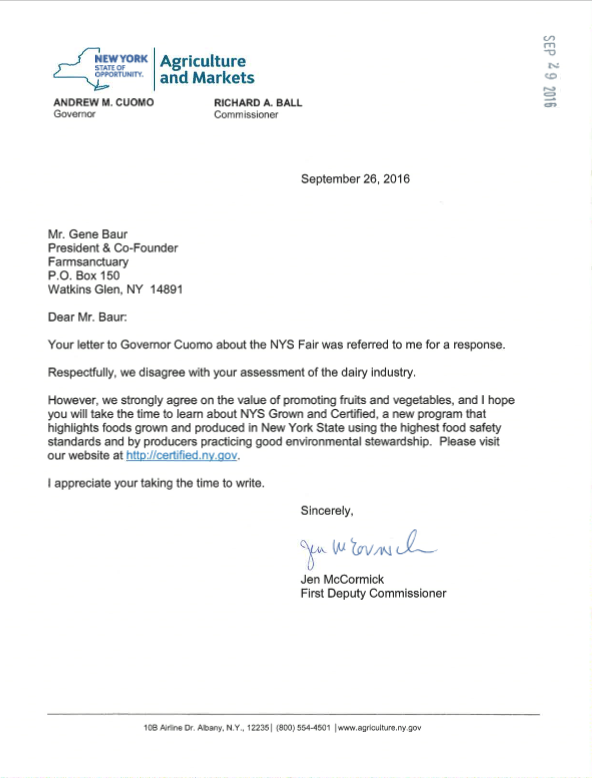 Andrew Cuomo announced that the state would subsidize the well-known Milk Bar at the New York State Fair, allotting $90,000 to keep the price of a cup of milk at a quarter. 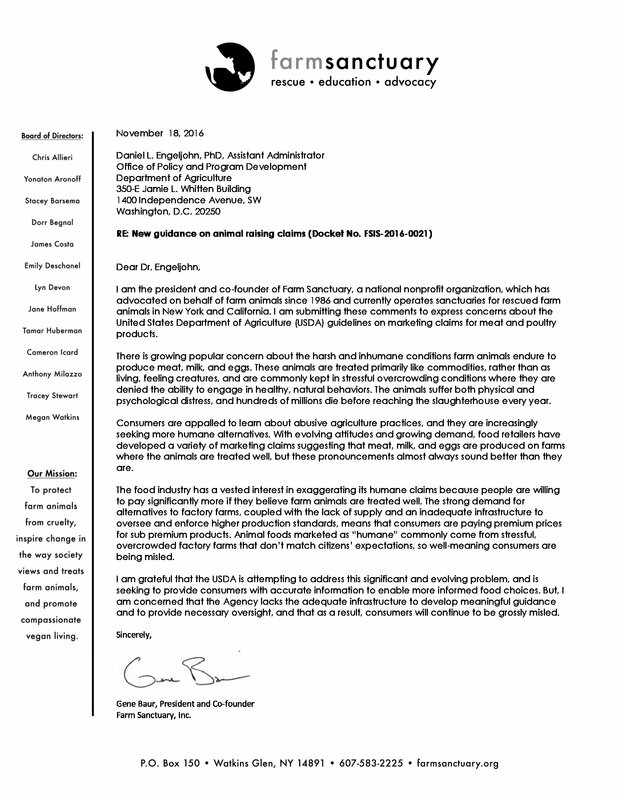 Farm Sanctuary President & Co-founder Gene Baur — who for three decades has been spreading the word about dairy’s damaging effects on animals, human health, and the environment — wrote to Gov. 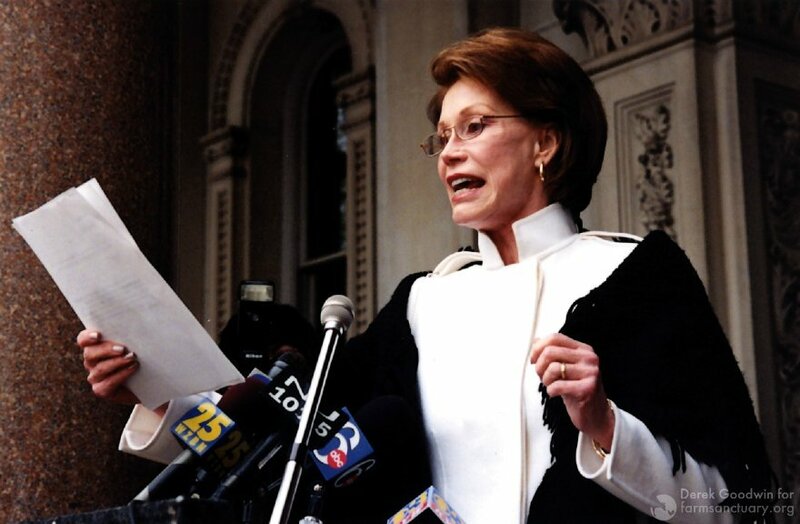 Cuomo, urging him to reconsider. Recently, the governor’s office replied, reiterating support for the dairy industry but also noting an area of common ground. As 2015 drew to a close, a deadly winter weather system raged across the U.S., lashing multiple states with wind and snow. The storm, named Goliath, claimed among its casualties more than 30,000 cows on dairy farms in Texas and New Mexico. As the Weather Channel reports, it is believed that many of the cows suffocated to death when they were pushed against fences by snowdrifts up to 14 feet high. So many cows perished that farmers have struggled to dispose of the bodies. Though the immediate cause of death for these cows was a natural disaster, the ultimate cause was man-made. As we saw last year in the massive death toll of the 2015 bird flu outbreak and the Ohio highway disaster that killed hundreds of piglets, the animal agriculture industry’s reliance on raising, transporting, and slaughtering animals on a large scale creates the conditions for large-scale tragedy. 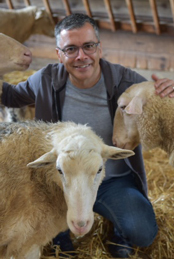 Designed to maximize output while minimizing costs, this production model prohibits adequate health and safety measures for individual animals. The cows who died in Texas and New Mexico were kept in large numbers on farms where they did not have access to the shelter, dedicated onsite staff, and individual attention that could have saved them from death in the blizzard. Farm Sanctuary Shelter Manager Jill checks on herd members to make sure everyone is doing well in the snow. 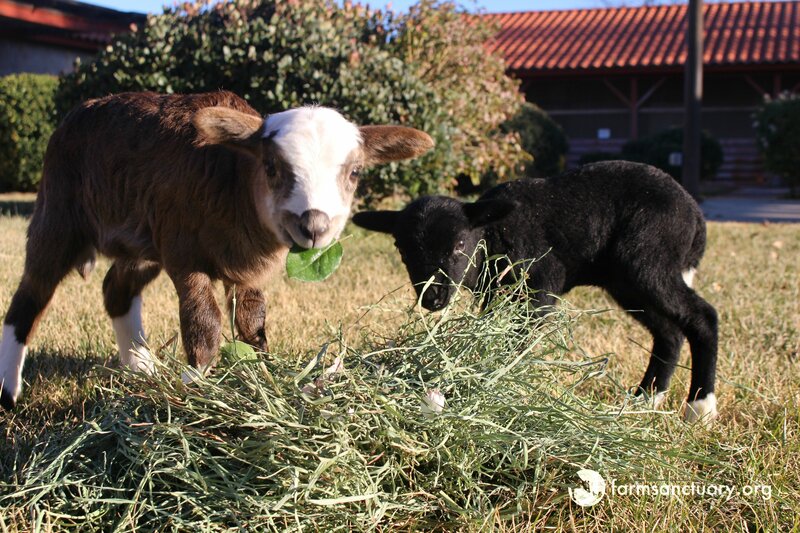 At Farm Sanctuary, we are committed to the well-being of each and every animal in our care. Cattle at our shelters have access to warm barns at all times. During the winter, staff members diligently monitor and clear the pathways and outdoor areas our animals use to make sure that no one slips and falls. 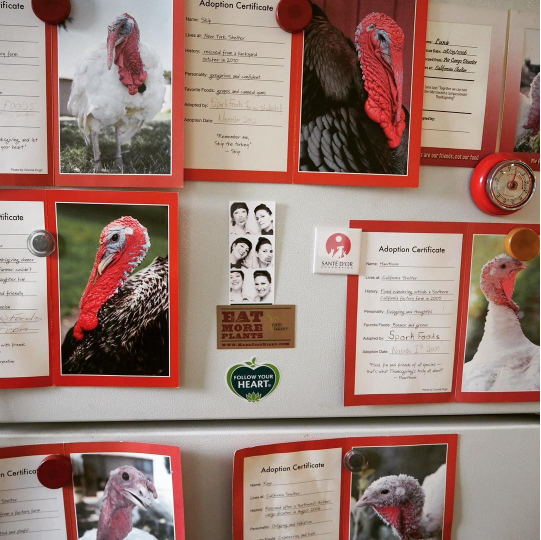 We also make maintain a caregiver-to-resident ratio that allows us to give individual attention to every animal, ensuring that no one is ever left out in the cold. Such precautions are costly, of course, but they are necessary for any operation that truly puts the animals first. On a commercial farm, where profit is the imperative, this sort of individual consideration is unfeasible; animal welfare and animal exploitation are irreconcilable. It is not only the farmers themselves who place fiscal considerations above the well-being of individual animals. It is the pervasive view of farm animals as mere commodities that allows this industry to operate at all. Take the media coverage of this tragedy, which has emphasized the economic impact of the fatalities, and the resulting drop in the region’s milk production, on producers and consumers. 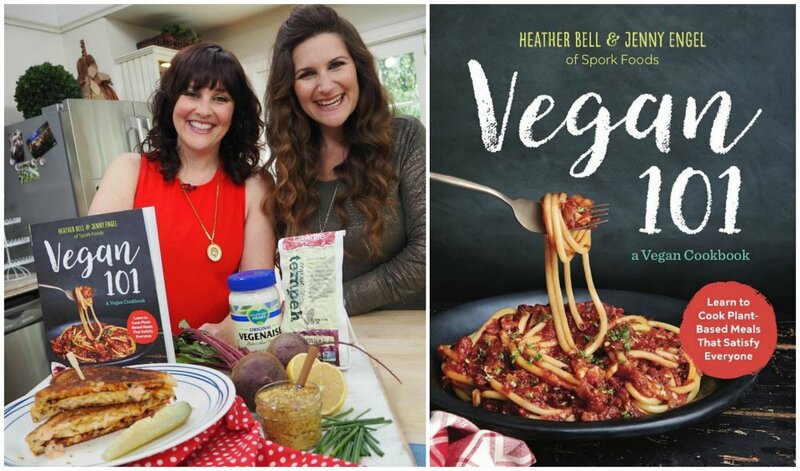 In a society where we consume the bodily products of animals we never meet, a milk shortage will meet with a stronger reaction than will the deaths of 30,000 cows — sensitive, intelligent beings who, as we do, possessed personalities, desires, and fears. Winter storm Goliath has now subsided, but another Goliath rampages on. The dairy industry, formidably armed with economic and political clout, exploits several million cows and kills approximately 2.5 million “spent” cows every year. 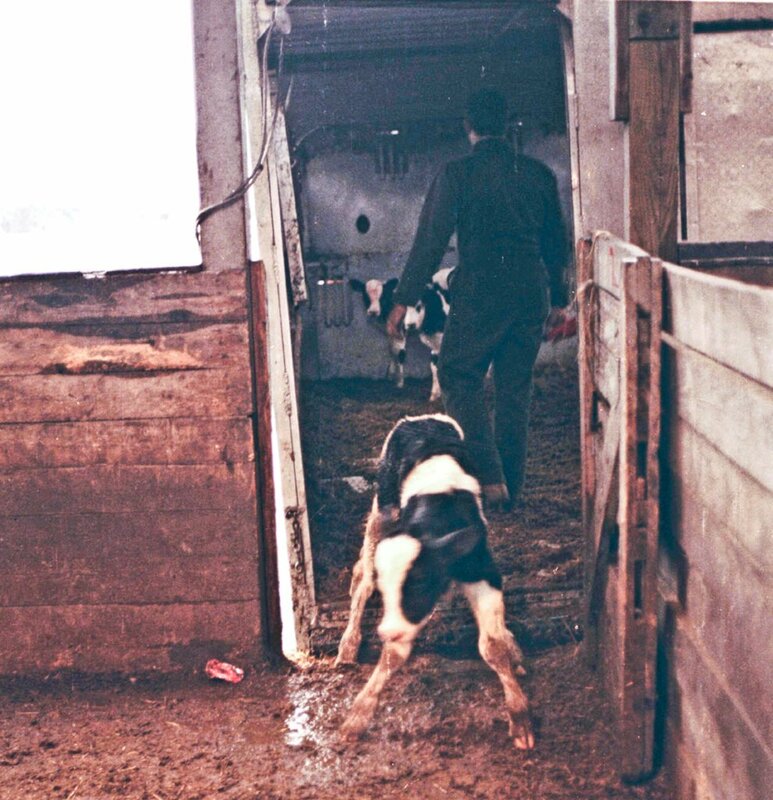 Cows on dairy farms are subjected to a grueling cycle of insemination, pregnancy, and milking that leaves them frail and hurting. Their babies are taken away from them at birth, the females to be raised as replacements and the males to be sold at auction for veal or beef production. This is an industry that separates families, squeezes every cent it can from its animals, and discards those animals when they can no longer be milked for profit. 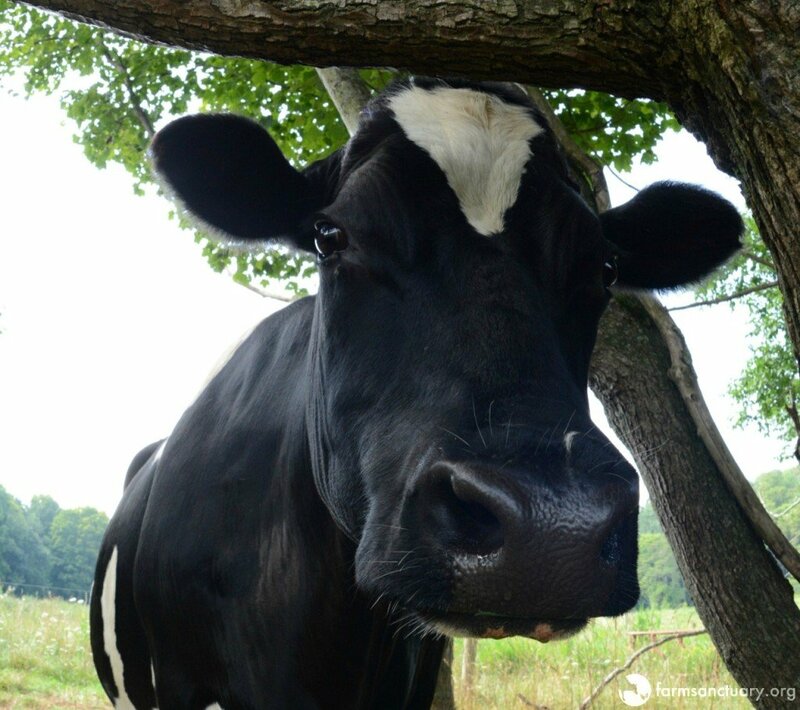 At just five years of age, Farm Sanctuary resident Diane cow was considered “spent” and would have been auctioned off and slaughtered had her rescuer not stepped in to save her. Read Diane’s story at AnimalsofFarmSanctuary.com. Unlike a winter storm, this giant killer of cows and calves is not going away on its own. Along with our allies and supporters, Farm Sanctuary has been fighting on behalf of dairy cows and calves for three decades, and our resolve is as strong as ever. 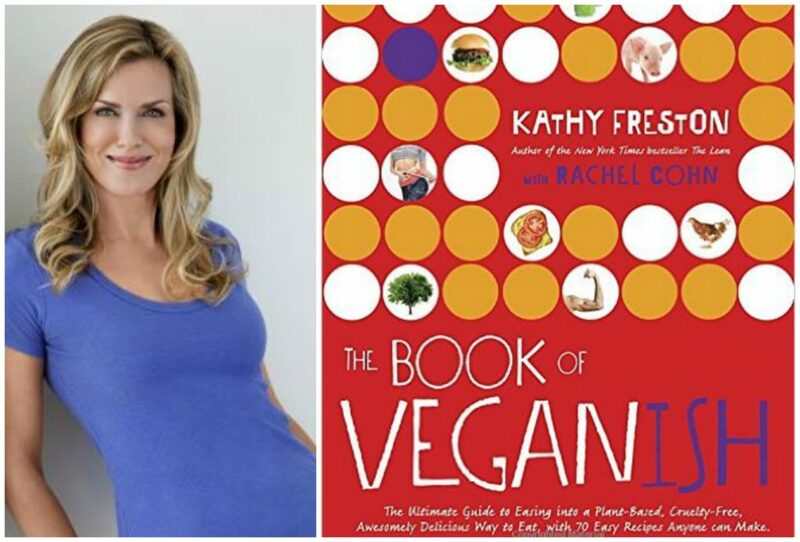 The first step in this fight is one anyone can take: Boycott dairy products. 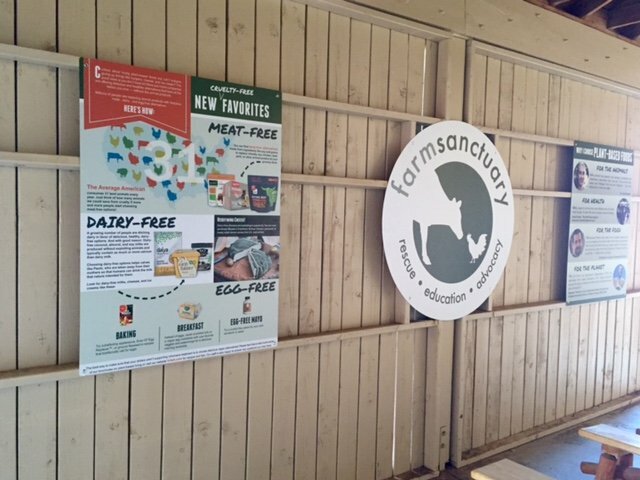 To find out what else you can do, please follow Farm Sanctuary on Facebook and Twitter and visit us at farmsanctuary.org. Together, we can stop this Goliath.